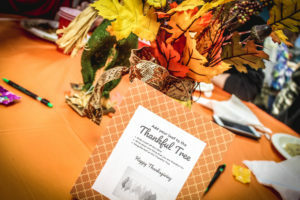 New Hope Academy’s students and staff from the Doylestown and Yardley campuses gathered together on Tuesday, November 20, 2018 for the annual Thanksgiving Day Feast, an event that serves as the unofficial kick-off to the upcoming holiday season. NHA president Kathy Rosso-Gana welcomed everyone and began the luncheon by asking students and staff to share their Thanksgiving Day traditions. Many spoke of traveling, spending time with family, and eating delicious food. The audience was then asked to share what they were thankful for, which they did in abundance. Many cited their appreciation for NHA and its teachers, while others expressed their thanks for their family and friends. Next, the four winners of NHA’s Short Story Contest were announced; the annual writing competition is organized by the English Department and rewards students for their original creations. 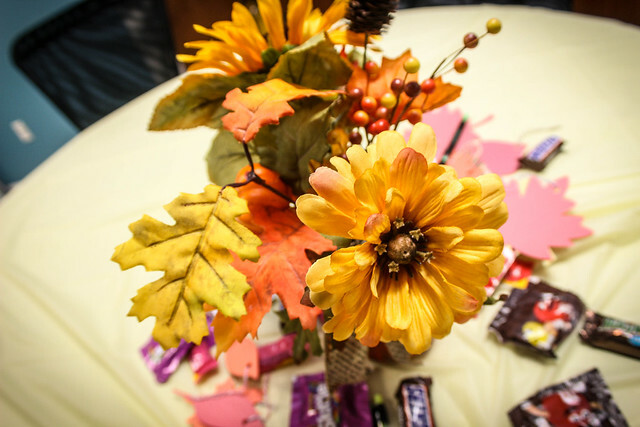 Finally, students were served a traditional Thanksgiving meal – including turkey, gravy, mashed potatoes, and stuffing – by NHA staff, who donned aprons and took orders. Afterward, students enjoyed an afternoon of “Coffee House,” an NHA tradition that allows students to socialize and relax. Some students participated in the annual “Turkey Bowl,” a football game organized by Yardley Phys Ed teacher Mark Beuerle. Others stayed back and played games, jammed in the Music room, expressed themselves in Art, or watched a movie. It was a wonderful day, one that was filled to the brim with gratitude, food, and fun!